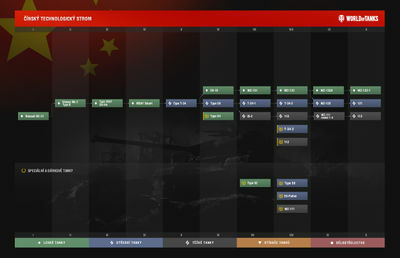 Vehicles imported into the 20th-Century Chinese warlord states and Republic of China that were used in WW2 and Chinese Civil War in early tiers, And The vehicles designed by PR China (Communist China) and ROC of Taiwan, Tanks tend to carry the largest possible calibers into battle but pay heavily for the privilege. Chinese tanks, for the most part, have unparalleled mobility, good camouflage values and sloped armor. This makes their tanks very flexible regardless of if they are a heavy, medium, or light. They still play as you would expect, but they can often change their combat role a bit, should it be necessary. However, they have very poor gun depression, even worse than German or Russian tanks, and arguably the worst in the game. They also have very poor module health, and their modules are usually exposed. This results in frequent crew loss, destroyed tracks, engine fires, or even ammo rack detonation. However, while most Chinese tanks have (comparably) poor hull armor, their turret armor is unparalleled, sometimes even surpassing the hull armor values of heavy tanks. Chinese Light Tanks are fast, agile, and have good penetration and accuracy. They play very much like medium tanks. Their armour is really the only thing identifying them as light tanks. They receive the worst hitpoint pools and also lack firepower to compete with other nations' light tanks. Chinese Medium Tanks are, up to a point, very similar to the Soviet ones, combining mobility and firepower, at the expense of a low rate of fire and poor gun depression. At higher tiers they gain firepower and become more adept at brawling than their Soviet counterparts, while being less well-rounded. Diese Seite wurde zuletzt am 7. August 2018 um 14:32 Uhr geändert.